You can be an important part of Camp Berger! The hope is this will be the turn around year for the camp. Letters have gone out to Pomona and Community Granges outlining what we would like them to do. However many Grangers do not attend meetings and this is a notice to those members. We need more kids to attend! Attendance had dropped for many years. Gone are the days when we had a waiting list, and that would be an ideal problem. This will also be the last year at $300 a week tuition. The Granges have been approached to award Camperships, and to donate toward some items that need to be replaced this year due to wear. This is where you all come in. 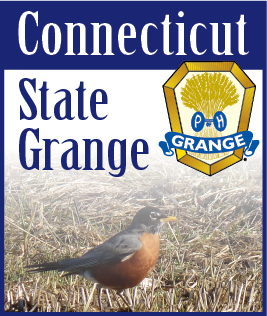 We need members that can add to the campership funds, either at your Grange level or send to the state fund, Connecticut State Grange, marked “Campership”, P.O. Box 1393, Glastonbury, CT 06033. Many Golden Sheaf members remember the fun they or their kids had at camp. Whether you still attend meetings or just enjoy this paper to keep up on what everyone is doing, you can be an important part of camp rejuvination. The clean up day is over and next on the list are the two Open Houses and Tours, Sunday May 22nd and Saturday, June 25th - tours noon to 3pm. If you can, please come and visit our beautiful piece of property, and see what you can do to help.